On a day when first practice had its fair share of moments for drivers of the Verizon IndyCar Series, practice two from the Barber Motorsports Park was far from boring in its own right. At the end of the day’s second free practice session, it was once again a Team Penske Chevrolet sitting atop the leaderboard as defending series champion Josef Newgarden posted a time of 1:07.434s to pace the field. Newgarden’s effort was a fine comeback from practice one, where he set the second fastest time and then promptly spun his car entering the hairpin at turn five. “I love this racetrack. I think it’s one of the best that we get to drive at from sort of a style standpoint,” Newgarden said. “It’s very technical, but it’s got a lot of flow to it. It feels kind of like a roller coaster to me is the best way to describe the style of it. I have a lot of fun here, I think it’s great. The top five shuffled just a bit from session two as Ed Carpenter Racing’s Spencer Pigot laid down a quick lap in his No. 21 Fuzzy’s Vodka Chevrolet on the Firestone alternate red tires. His lap of a 1:07.537 was just a tenth behind Newgarden and two tenths ahead of Dale Coyne Racing’s Sebastien Bourdais, who set a time of 1:07.797 in his Honda-powered machine. 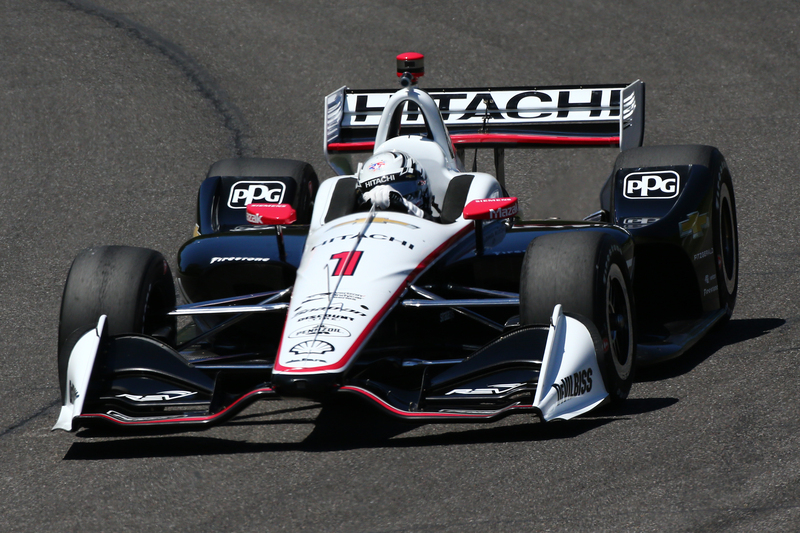 Session one leader Will Power was fourth-quickest and the latest IndyCar race winner, Alexander Rossi, was fifth. There were no shortages when looking for exciting moments on-track in this session, as there were three red flag periods brought on by driver accidents that slowed the session. By our count, a total of eight drivers had mishaps in the session. Andretti Autosport driver Zach Veach and Team Penske’s Simon Pagenaud were each victims of the same turn five hairpin which caught out Newgarden earlier in the day, spinning off of the track and bringing out red flags when they stalled in the gravel trap. The resemblance in each spin shows that the corner is taking no prisoners this weekend, wrecking a rookie (Veach) and two series champions (Newgarden, Pagenaud). The biggest incident came when Juncos Racing rookie Rene Binder went straight off at the course’s sweeping right hand corner and nosed into the tire barrier in a similar fashion to his accident in the Firestone Grand Prix of St. Petersburg. Binder has been vastly outmatched in his two Verizon IndyCar Series rounds in 2018 and has yet to make any significant improvements in his driving. Ryan Hunter-Reay, a two-time winner at Barber Motorsports Park, had a nail-biting flirt with the wall in this session which saw him run incredibly wide on corner exit before gathering up his Andretti Autosport machine before it made contact. On the flipside, Andretti Autosport as a whole was vastly improved from session one where they failed to put a driver in the top-12. In session two, Rossi was fifth while his teammates Hunter-Reay (7th) and Marco Andretti (9th) each jumped inside the top-10. The rookie Veach was a respectable 14th despite his incident at turn five. Speaking of rookies, Dale Coyne Racing’s Zachary Claman de Melo was the surprise quickest rookie on the day when he posted a time in practice two of 1:08.361s, good for 12th quickest. He outran Ed Carpenter Racing’s Jordan King, who dropped from 7th in session one to 17th in session two. Chip Ganassi Racing was not as strong in second practice, which will resemble qualification conditions on Saturday, as they placed Scott Dixon in 6th and teammate Ed Jones dropped all the way to 15th. Schmidt Peterson Motorsports continues to have a sub-par weekend at the moment, as Robert Wickens (16th) and James Hinchcliffe (18th) were both outside of the top-15. Look for them to come alive a bit more on Saturday and in qualifications. And also of note, A.J. Foyt Racing has struggled mightily this weekend as Tony Kanaan and rookie Matheus Leist have failed to end practice any better than 19th. Keep an eye on Open-Wheels.com for Saturday updates from the Honda Indy Grand Prix of Alabama.